Sathiah Thennarasu obtained his B. Sc. (1985) from Madurai Kamaraj University and M. Sc. (1987) from Annamalai University in Tamil Nadu, India. He started his chemical research career in 1988 on cyanoacrylate monomer synthesis, with Dr. Noori Krishnamuthi in RRL(H), Hyderabad and then became a CSIR JRF (UGC−CSIR NET, 1988) with Prof. R. Jeyaraman, in Bharathidasan University, Tamil Nadu. Later on, he became a Scientist (1990) in the Centre for Cellular and Molecular Biology, Hyderabad. Since 1997 he has been working in the Central Leather Research Institute, Chennai. He obtained his Ph. D. degree (2003) in organic chemistry from the University of Madras. He has been a Post-Doctoral Fellow in the University of Michigan, USA (2004), a Senior Research Fellow in Nanyang Technological University, Singapore (2006-2008) and a Visiting Scientist in the University of Michigan, USA (2009-2010). 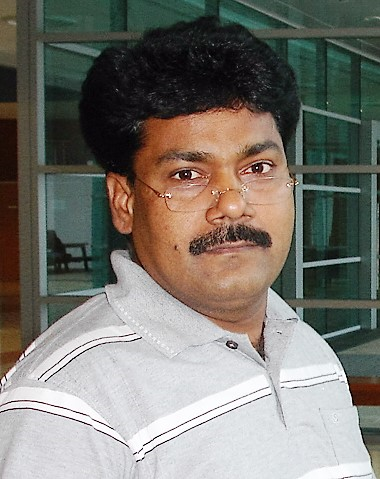 Since 2011 he has been working as a Senior Principal Scientist in the Central Leather Research Institute, Chennai. His research dealing with antimicrobial peptides were mainly focused on (i) design and synthesis of short peptides with defined secondary structure, (ii) crafting peptide sequences for cell selective activity, and (iii) examining the nature of peptide-membrane interactions using various spectroscopic and analytical methods. His research interests include the synthesis of unnatural amino acids and heterocyclic molecules for the development of antimicrobial agents. In the last five years, he has been involved in the development of fluorescent sensors for toxic metal ions and anions as well as for bio-imaging applications.